Study Bachelor of Medical Radiation Science (Medical Imaging) at the University of South Australia (UniSA). Information for International students. Learn in fully functioning x-ray suites on-campus. Get hands-on experience when you complete clinical placements as part of your studies. Medical imaging professionals (diagnostic radiographers) are responsible for producing high quality medical images using various technologies and types of radiation to monitor and diagnose injuries and illnesses. Their work includes general radiography such as x-rays, fluoroscopy, theatre or emergency imaging. As a medical imaging student, you will learn in fully functioning x-ray suites on-campus, where you’ll gain valuable hands-on experience. Further practical experience is gained during over 1,750 hours of clinical placements, complemented by an in-depth theoretical component taught by our award-winning teachers. With a suite of state-of-the-art imaging facilities located on-campus, it’s easy to see why this degree is so highly regarded both nationally and internationally. 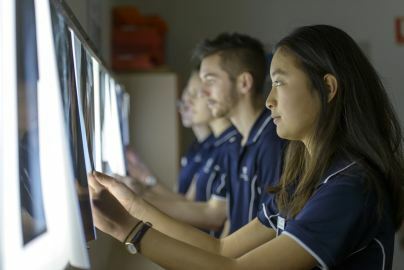 High achieving students may be considered for the Bachelor of Medical Radiation Science (Honours) (Medical Imaging) program in the third year. Throughout your degree you will learn how to produce optimal images, which involves using complex equipment whilst caring for patients and working across a variety of locations. 2. Students must successfully complete a "Provide First Aid" course before they will be able to commence RADY 2012 Medical Imaging Clinical Practice 1. 1. Students will enrol in the medical imaging specialty at the commencement of the program. Transfer to other specialty streams (nuclear medicine or radiation therapy) is only permitted within the bounds of available clinical placements and, where necessary, will involve ranking by academic performance in the first year. 2. The clinical courses (Medical Imaging Clinical Practice 1-4, Medical Imaging Honours Clinical Practice 4, Medical Imaging Professional Entry Practice 1-2 and Medical Imaging Honours Professional Entry Practice 1) form a significant part of the program and students are required to be reasonably fit to successfully undertake these components. 6. Students will be required to undertake a Certificate of Mandatory Notification before commencing RADY 2012 Medical Imaging Clinical Practice 1. This degree offers extensive practical learning, coupled with the support and mentoring from award-winning teaching staff and academics. Our on-campus facilities, which include x-ray suites, mean you will get plenty of practical experience, ensuring you graduate career-ready. This will be complemented by more than 1,800 hours of practical work placements in Adelaide metropolitan areas, rural and interstate settings, where you will practice the skills learned in class. As a medical radiation science student you will benefit from our strong industry links. You will learn from experienced medical radiation professionals on-campus, and during work placements Work placements offer the opportunity for you to build practical skills and also enables and encourages the building of valuable industry networks and relationships. 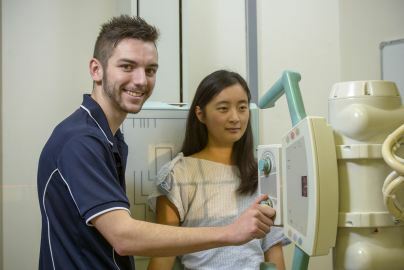 As Australia’s population ages, the demand for medical radiation professionals increases1, creating significant opportunities for graduates of this degree. You should enjoy working with people, with technology, helping sick or injured people, working a variety of hours, be interested in the human body, being challenged by new ideas and being part of a team. As a medical radiation science student you will have access to on-campus medical imaging facilities, including fully functioning x-ray suite with associated software packages. It would be my dream to make a lasting contribution to the advancement of the radiography field. I am passionate about research and how modern healthcare practice must be underpinned by the best evidence. I want to discover the answers to questions we don’t even know exist yet.